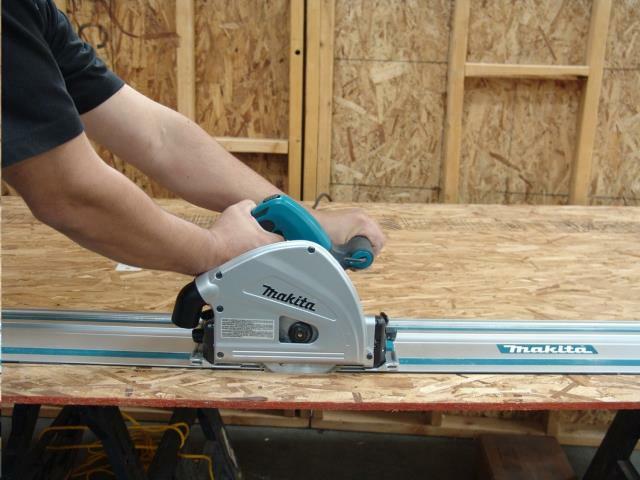 The Makita 6-1/2 Plunge Cut Circular Saw (model SP6000J) delivers precise and more accurate cutting when combined with an guide rail system constructed with anodized aluminum for smooth, straight cuts. The saw and rail system work together to produce accurate cuts with minimal tear-out. The saw combines a powerful 12 AMP motor and a large cutting capacity with magnesium components for less weight and electronic speed control to maintain constant speed under load for smooth cutting and a splinter-free mirror finish. The SP6000J is a more portable option to a table saw for select applications, and it is ideal for use on the jobsite or in a workshop. * Please call us with any questions about our guide rail saw in Mason OH, Westchester OH and Cincinnati metro area.